We thought these cufflinks from Saverio are such a great way to incorporate your family history and honor your family. 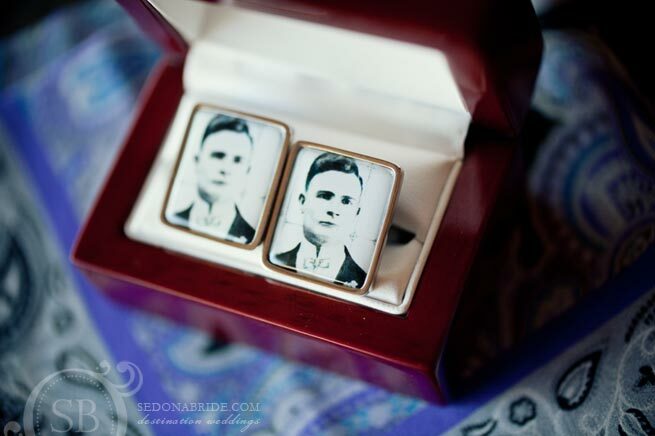 Saverio can make custom cufflinks using a photo of the groom’s father or grandfather. Custom cufflinks also make great gifts to the groomsmen as Saverio also makes custom engraved cufflinks. Or how about using a vintage picture of the red rocks for the cufflinks? What a great gift and souvenir for the groomsmen. Saverio is a custom clothier and creates beautiful suits, shirts, custom ties, cufflinks and other wedding attire for men. Be sure to contact Eddie Fischer at Saverio to schedule an appointment and add that special look to the groom and groomsmen.